Arcane bits of the tax code provide a huge tacit subsidy for the producers of fossil fuels, according to a recently released study. From 2002 through 2008, the U.S. federal government spent about $72 billion subsidizing fossil fuel industries, much of those benefits embedded in arcane tax codes written in another era, for a different kind of energy economy. That number is more striking, according to a study released today by the nonpartisan Environmental Law Institute, when paired with the subsidies government has funneled toward renewable energy. Only $29 billion was directed to renewables over the same period, and more than half of that toward corn ethanol that many scientists now think may do more harm than good to the environment. Traditional renewables — wind, solar, hydro, geothermal and biomass energy — received just $12.2 billion of government nudging, a figure that hardly jives with stated policy goals of the U.S. to "green" the country&apos;s economy. "Part of the reason we picked this time frame is that 2002 is after people were well aware of the need for the development of renewable energy," said Daniel Schramm, an ELI fellow who contributed to the study. "And government was on notice, at least in its public pronouncements, claiming that it was now going to be focusing on renewable energy." As for whether or not that has happened: "Well," he added, "the graph speaks for itself." 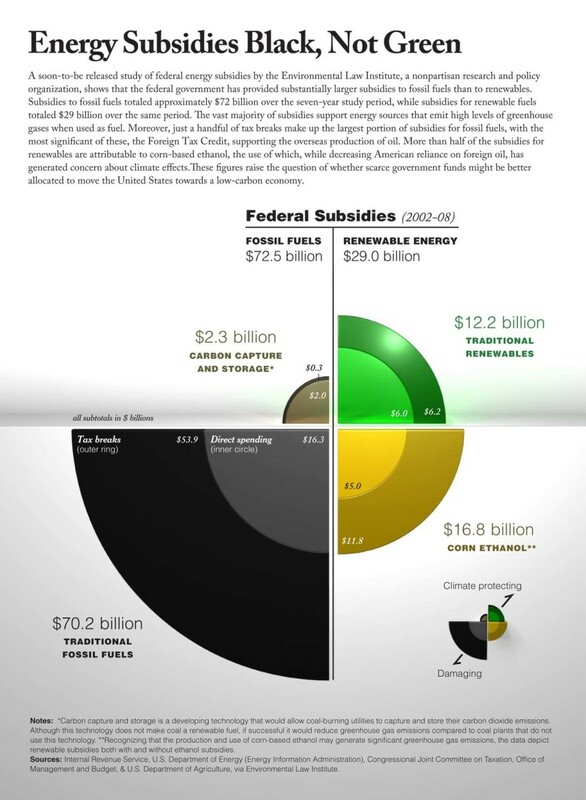 The ELI project, presented at the Woodrow Wilson International Center for Scholars in Washington, attempted to corral the federal government&apos;s myriad explicit and hidden subsidies into a single graphic (also shown below) translating broad energy priorities into dollar bills. "Definitely the data that we quantified is meant to ask that question: Should we allocate resources differently going forward?" asked Lisa Goldman, an ELI staff attorney. "And how should we do that?" The study stopped short, though, of recommending what policymakers should do about the question. The most obvious answers — but the most difficult to execute — may be found where the ELI researchers traced the largest subsidies: to decades-old U.S. tax provisions. The largest single subsidy in the report involves the Foreign Tax Credit and a provision dating to the early 1950s that allows oil companies to claim royalty payments made to foreign countries as income tax paid to those countries, and therefore tax credits back home — "an accounting fiction," according to the report. The FTC is meant to ensure that corporate and individual taxpayers aren&apos;t taxed twice on the same income both overseas and in the U.S.
"In fact, they are taxing the way we told them to," said John Pendergrass, an ELI senior attorney. And the way we told them to back in the 1950s. Over the 2002-2008 period, that policy amounted to a subsidy of $15.3 billion — money essentially paid by the U.S. government to bolster the very foreign oil officials say we want to wean ourselves from. Other tax benefits included in the study date as far back as the 1910s. "At the beginning of the 20th century, it may have been a wholly appropriate public policy to do everything possible to encourage investment in oil and gas and coal," Schramm said, "because at that time, you have the dawn of the age of the automobile and the development of the electrical grid for the country. Of course we wanted this stuff, and no one had a full sense of the environmental externalities that were associated with these types of fuels." 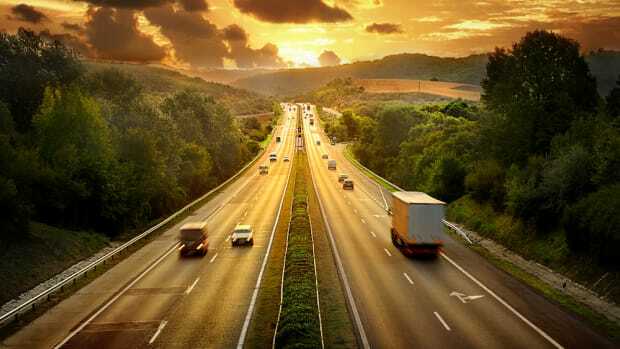 The climate — literally and figuratively — has changed dramatically since, suggesting the government may be applying a carbon-based tax code to what many hope will become a carbon-free economy. The ELI report also found that most subsidies benefiting renewables stem from energy bills initiatives with expiration dates, while those benefiting fossil fuels are written into tax code as permanent provisions, making them that much harder to dislodge. "There&apos;s this idea that once something is put in the tax code, it&apos;s very difficult to take it out; it becomes accepted as part of the normative baseline of what tax law should be," Schramm said. "So especially these provisions that have been around for 100 years, they&apos;re entrenched, and they have an entire sector of the economy that is entrenched with them. Pulling it out is like removing an organ." If we taxed corporations on the profit they report to shareholders, they'd lose the incentive to buy billion-dollar tax breaks from Congress. It's a veiled stimulus plan to bring back fossil-fuel jobs.